IT is most effective as your partner, least effective as your adversary and mostly inflexible when ignored. Ever since the PC crept into organisations and into the hands of end-users, the roles of IT and the user community have been complicated by the need for IT to maintain leadership in terms of strategy and mission fulfillment while the end-user’s thirst for functionality and value delivered through the desktop, mobile devices, cloud and application software was too often sated by un-sponsored, independent projects. Your CPQ software solution can’t be one of those projects. CPQ software solutions offers great advantages not only to the sales group but also to the enterprise as a whole. But, it should be understood that implementing a CPQ software solution is not a drop in and go project. You will want and need IT to help facilitate this project using all the tools and advantages delivered within the context of their change-management strategy. This extends well beyond esoteric matters such as CPQ platform requirements to include more important aspects of implementation like CPQ user training and deployment beyond the sales team. IT will smooth the way for your project. Many of the bumps and detours that are common to implementation will be eliminated through the efforts of your IT partner and project leader. Let’s look at three areas where IT is critical to the success of the CPQ software solution implementation project. We are writing about CPQ software as an enterprise app in these blogs. It is important to see a CPQ software solution as something beyond a sales tool. IT is in the best position to help you assure that all stakeholders involved in CPQ are included in the project. These will obviously not only include the sales operation but also finance, order management and supply and production operations as well as distribution and logistics. IT knows how to implement new processes that involve assorted functional groups within the enterprise. This is accomplished via highly developed change-management strategies and processes. IT knows how to bring executive support to bear, who to lean on, who to include and how to gain their support and commitment to success. This will take a huge burden off the sales organisation or management. Do you use a CRM system? What kind of ERP is deployed within your organisation? Are there standards for mobile hardware and operating systems? How does your corporate firewall and other security measures work outside of the physical organisation? Are you supporting an international implementation of CPQ? These are important questions, and they are not always easily resolved. This is the daily bread of IT. They will not only assure that the platform requirements are met, they will also likely obtain significant cost savings for your organisation through buying agreements and partnerships. 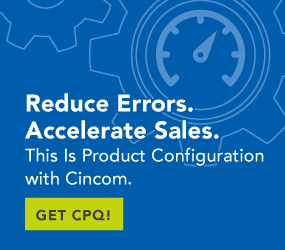 Training Sales is just the beginning for rolling out CPQ. The other areas within the enterprise that touch the product will require training as well. Even those who might not actually use CPQ need to know how CPQ works and what information they may be required to supply to the CPQ platform. Product managers and engineers will need to think in terms of usage as well as environmental and capacity limits. These are typical areas where customers specify some performance requirements, and they must be quantified and reduced to specific business rules for CPQ. Order management and production scheduling will need to understand what a product order means to them in terms of capacity planning, supply and inventory management and job scheduling. CPQ software will make their lives easier, but they still need to know how to take advantage of it. IT is essential to the overall success of your CPQ deployment. In addition to their change-management strategy, assistance with CPQ user training and CPQ platform requirements, they are knowledgeable in the areas of ongoing maintenance and support of the product itself. Upgrades and product updates should be handled deliberately and in a timely fashion. Selecting the best solution means including IT in the decision-making process. IT is your partner in CPQ software solution success.